Without Aleksandar Gilic, Montenegro’s nightlife would be very different. As we described in two recent features on Montenegrin venues and DJs, Gilic pioneered the country’s dance music scene as DJ Gilerz and a brain behind one of the capital’s best clubs, District. This weekend we’re taking over the space with George FitzGerald, the Zenker Brothers and more for a two-day Electronic Beats Festival in Podgorica, so it seemed like a good time to reflect on our past endeavors in the Balkans. We set Gilerz up with a new talent, Fil Lavin, both of whom have played the Montenegrin Electronic Beats Festival in the past and will DJ tonight and tomorrow. Click here for more information and tickets to the festival. FIL LAVIN: Hi Gilerz. I spent the last 12 hours at a festival in Tivat, a city in the south of Montenegro. We gathered some of most interesting DJs in the area, like Soft 85, Chevalier, Ilija Rudman and Raven TK and had a crazy party. What are you up to? GILERZ: I’m preparing for the new season at District nightclub in Podgorica. At the beginning of the year we moved into a smaller space with capacity of 200 people, and I think we finally found the perfect place for those who truly want to enjoy good music. We have a successful year behind us, and now we’re preparing the lineup for the next clubbing season. FL: I always prefer to play in a small clubs, because you have better communication with the audience. 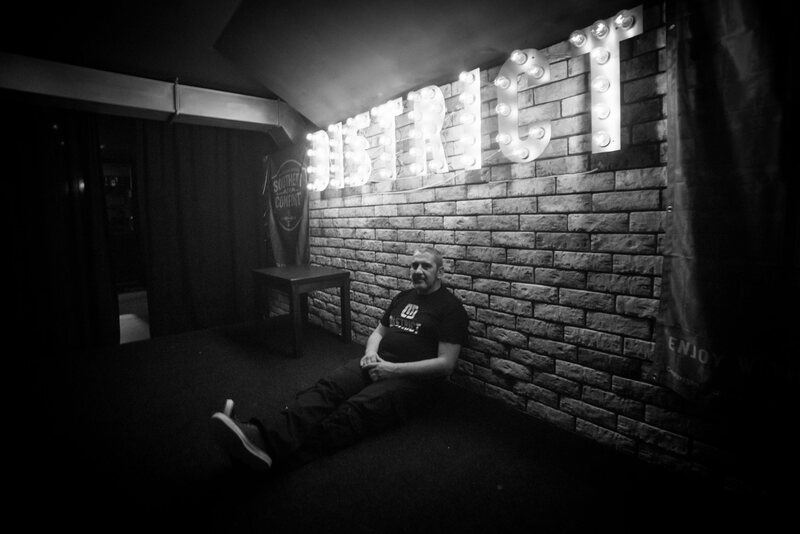 Unfortunately, I haven’t been to District yet because I moved to Belgrade [Serbia] a few years ago. But DJ Mili Sefic told me that he spent one of the best nights of his life at District. G: That’s true—he had fantastic feedback from the audience and we’re going to host him this year, too. He’s from Chicago, but our main goal is to promote DJs from Montenegro and the surrounding region. I believe that Montenegro now has a new generation of very talented DJs and producers, and we want to give them a chance to show their knowledge to those who appreciate good music. I still can’t talk about the specifics of the lineup, but I can proudly can say that the Electronic Beats Festival is going to open our next clubbing season. FL: Oh, that’s a good motivation to visit District. I’m so glad the organizers selected the cafe/bookstore Karver as one of the festival venues. That place is surrounded by the [Ribnica] river, and it’s just magic. I’m expecting a great lightshow and sound effects like in years past. G: You performed at the first EB festival in Podgorica. Do you remember that night? FL: Yeah. It was a a little weird because the festival was held in the Montenegrin National Theatre and everyone was sitting while I played dance music. G: Well, now we have a place made for dancing and there’s an impressive lineup. FL: That’s true, but you know, sometimes it’s hard to get Montenegrins to move their body. People from abroad used to ask me why people in Podgorica don’t like to dance. I started to think about our traditions and national dances, where people used to jump and climb on each others’ heads. So, maybe if we call [the Electronic Beats Festival parties] a “wedding,” everybody will to dance. G: Hah! Well, I’m sure that things have changed. Titograd, which is the former name for Podgorica, used to be a rock ‘n’ roll and disco city. At some point our music scene was contaminated by so-called “turbo folk,” and I think that the media outlets are responsible for spreading such bad taste. Anyway, there’s still a lot of people who recognize good sound, and they dance. We’ll see it at the festival. What are you planning to play on Friday? FL: For the opening night I’ve prepared two sets and I’ll probably present some new things I’m working on. G: I heard that you’re working on a new project. I still remember when you started out; you expanded on a minimal template and brought fresh elements of nu-disco and organic sounds. Are your productions different now? FL: Actually, I’m working on two projects. I would say that the music I’m working on right now is different compared to my previous work and the deep house and disco sounds I used to produce. There are techno elements in one of the projects I’m working on by myself. I’m working on a second project together with Belgrade DJ and producer Dusan Lolic, and I think that we’re going to present it soon. We’re experimenting with different genres by using live instruments. It’s ambient music with dub, deep and techno elements. G: Do you consider music production a hobby or your primary job? FL: Actually, I’ve never considered my musical career as a main job. I don’t live off my music, and maybe that’s why making it is still such a pleasure. It’s not easy to find a way to make good money and stay true to your style at the same time, and I don’t think that problem is unique to the Balkans. G: I never took on producing because I realized that I can’t be fully dedicated to that job. I’ve never felt ready to start that adventure. That’s why I prefer to be a digger and to make a good party atmosphere on the dance floor. For tickets and more information about the EB Festival in Podgorica, click here.